Eyerly Aircraft was famous for making rides that simulated flying. The Roll-O-Plane was based on an Immelmann turn and the Octopus re-created the feeling of diving or hitting an air pocket. These were successful for many years, but it wasn’t until 1948 that Eyerly introduced a ride that wasn’t based on aviation. 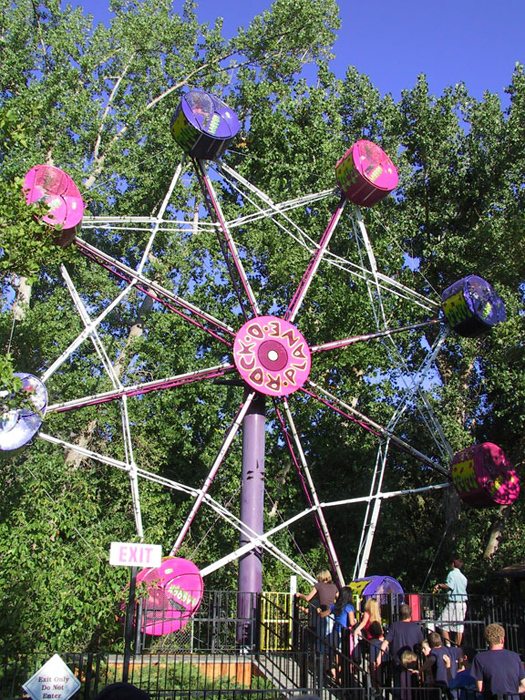 Rock-O-Plane was a more thrilling spin on the classic Ferris Wheel. Riders were able to rock and roll their cars as they wished or lock them in place in any position. 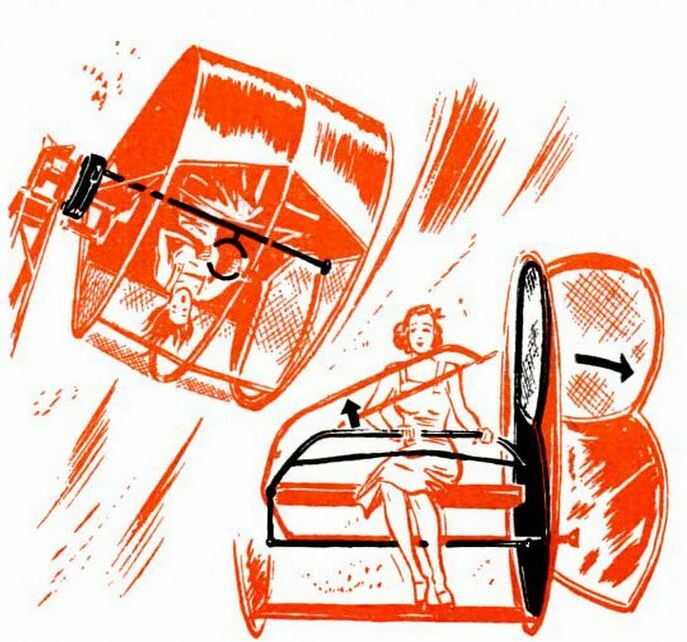 Illustration of Rock-O-Plane’s movement and safety mechanism from the July 1949 issue of Popular Science Monthly. 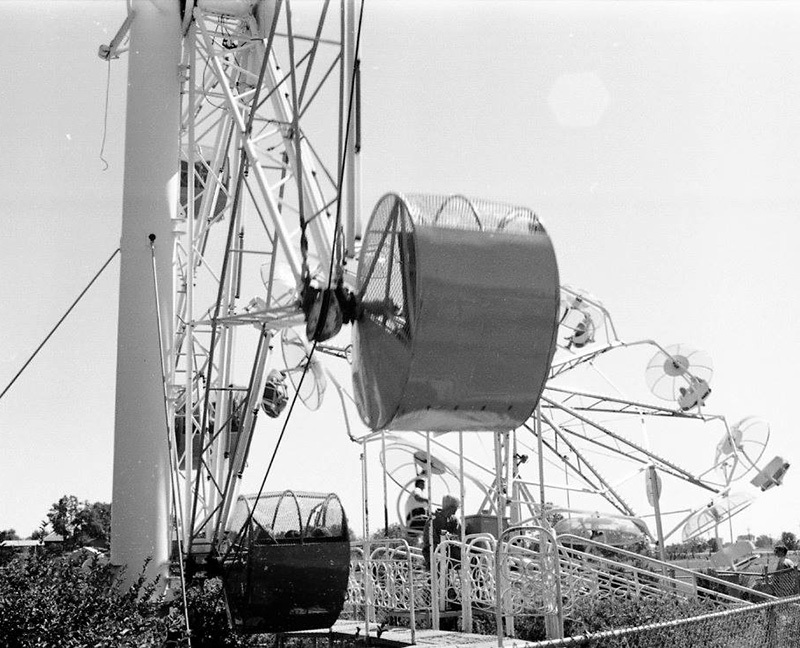 In an effort to get the park running again after a devastating fire in November 1953, Lagoon built new buildings and purchased several small rides in time for the 1954 season. 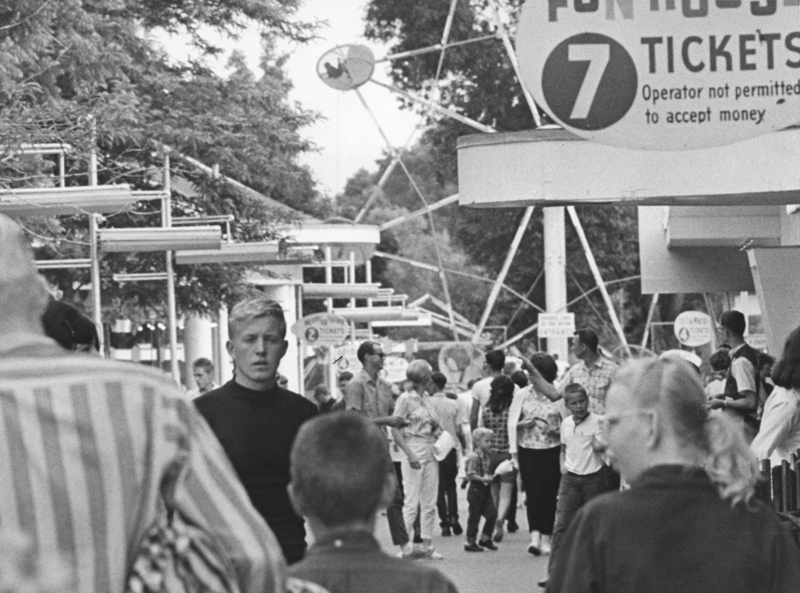 Three of those rides were from Eyerly Aircraft — the Roll-O-Plane, Octopus and Rock-O-Plane. 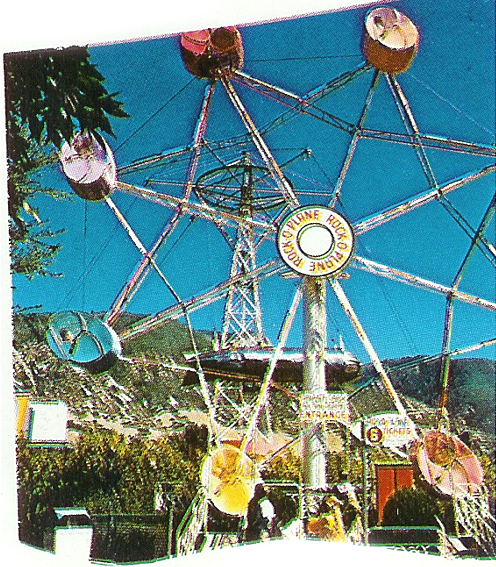 Rock-O-Plane in its first location, south of Roller Coaster, as shown in this 1954 postcard. 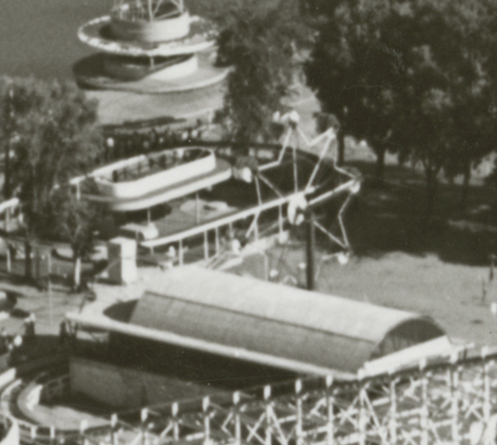 The photo above shows the Rock-O-Plane where it opened in 1954, just south of the rebuilt Roller Coaster station. 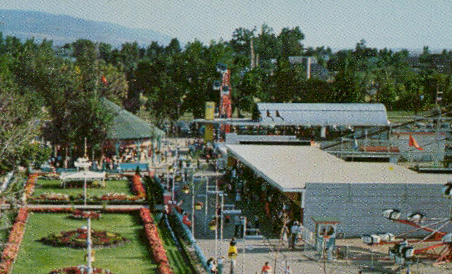 Next to that was a new building for different games and the Spook House (later replaced by Terroride in 1967). The Octopus was placed at the north end of that building where a new Fun House was constructed a few years later. Rock-O-Plane has stayed close to the same general area on the South Midway since it was first installed. 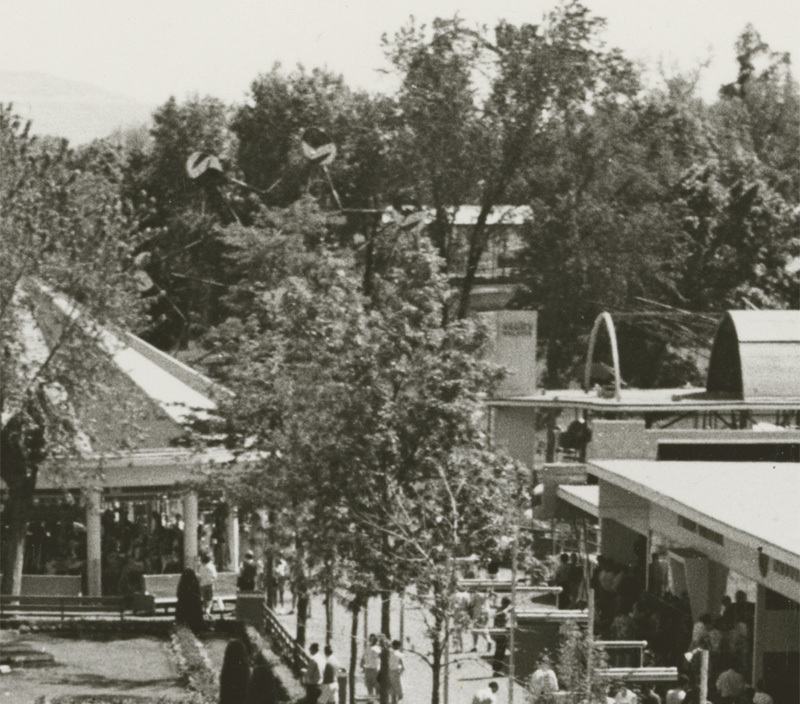 When Mother Gooseland opened in 1956, the Flying Jets (now known as Flying Aces) took the spot just south of the Roller Coaster station and Rock-O-Plane was shifted down the Midway, roughly where the Basketball game is today. 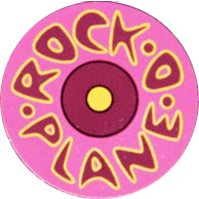 Until at least 1964, Rock-O-Plane was on the very end of the Midway facing north. (At that time the Midway didn’t extend past the what is now Teriyaki Stix). By 1967 it could be found west of The Rockets facing Speedway, Sr. It was finally placed in its current location around 1972. This photo from a 1972 brochure was most likely taken a few years earlier. The original paint scheme in 1954 was the typical pattern from the factory at the time in red, white and blue. It was very likely repainted many times since, such as the multi-colored design shown above. The colors used around the mid-’90s were purple and magenta with the famous, green, “vomit-style” lettering on each car. 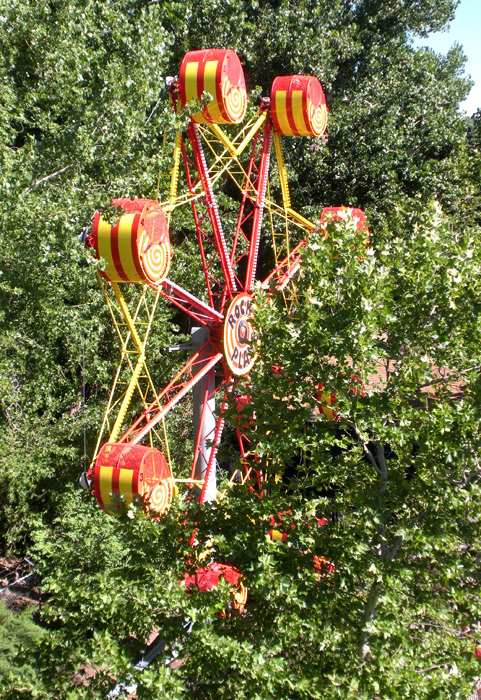 The ride was repainted most recently in 2013 with red and yellow spirals. Eyerly Aircraft – The story of how the aircraft company became a ride manufacturer. Photo. Deseret News, 6 Apr 1963. National Register of Historic Places, Lagoon Flying Scooter, Farmington, Davis County, Utah, National Register #12000884. National Park Service, 24 Oct 2012.